Children take a hands-on approach to art at ArtSpree, taking place at the Contemporary Museum on Saturday. For Kahala resident Kristen Chan, her husband, Michael, and their 9-year-old son, Jeffrey, the Contemporary Museum's annual ArtSpree is as entertaining as a circus, one in which art provides the fun and thrills rather than sword eaters, lion tamers and trapeze artists. Notes: Free parking will be available at Punahou School, 1601 Punahou St.; free shuttle service between the school and TMC will run throughout the day. Public parking and drop-offs will not be allowed at the museum during the event. Visitors requiring assistance must make prior arrangements by calling 526-1322, ext. 10. » Throughout the day: Ringmaster/master of ceremonies See (aka Cristian Ellauri) of Ong King Arts Center tells children's stories in rhyme. 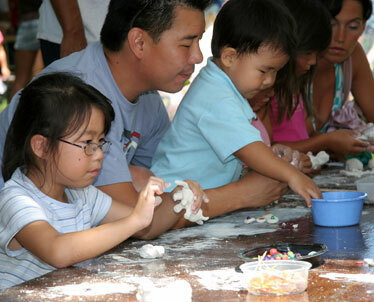 About 2,000 people are expected to celebrate the 15th anniversary of ArtSpree on Saturday, the Chan family among them. "We've been to every ArtSpree except one," said Chan. "When Jeffrey was very young, barely walking, he loved dancing on the grass to the musical presentations. He has also enjoyed the storytelling sessions and participating in the hands-on activities such as painting, playing with clay and making collages and mobiles. We're always there from the very beginning to the very end and have a wonderful time in between." Chan, an avid supporter of TCM, has co-chaired ArtSpree twice and believes it's not only a fantastic showcase of the visual and performing arts, but also a great way for families to spend a day together. "ArtSpree has activities that every age group will enjoy," she said. "I've always recognized the value of art, especially as a learning tool for children. When they're in preschool, pictures and songs are the primary teaching aids. As adults, art provides us with pleasure and food for thought. We may not all be creators of art, but we can all certainly appreciate it." AS USUAL, this year's ArtSpree will feature nonstop art activities and performances of music and dance. Brand-new offerings include About Face, where face painting will transform volunteers into Chinese opera characters, and Multiple Possibilities-Straw Sculptures, where attendees can make colorful, abstract sculptures from straws. Foamenology will give kids the opportunity to become sculptors, directors and performers as they create constantly changing formations with life-size foam bricks. Using innovative items such as remote-controlled cars with wheels made of crayons, Five on Fire also promises plenty of hands-on fun. ArtSpree was born after the nonprofit group Friends of the Contemporary Museum hosted an open house in October 1993 to celebrate TCM's fifth anniversary. It was so successful, they decided to sponsor a free event every year as a gift to the community. It was moved to July the following year, and dubbed ArtSpree by chairwoman Phoebe Campbell. There was no ArtSpree in 1995, but it has been held every year since then. "I remember for the first open house, we had no idea how many people, if any, would show up," recalled Susan Soong, one of ArtSpree's founders. "To our great delight, especially after months of planning, over a thousand people attended! It showed how us how hungry the community was for activities geared toward families." Natalie Aczon has helped plan ArtSpree for the past four years; this is her second year as chairwoman. "I'm an art lover and collector," she said. "I paint for stress relief; creating art is the only time we can let go and be ourselves without limitations. I plan my vacations around museums and can spend days in them. I sang and danced in theater productions in my youth. Art comes in many forms, and ArtSpree is an event that touches all of them in beautiful surroundings." Aczon also points out ArtSpree's universal appeal. "It really is for everyone: individuals, couples, families, friends and, most of all, children," she said. "This year I'll be there with my little grandsons Elijah and Moses, and I can't wait to see their reactions. ArtSpree is magical! It tingles all the senses." 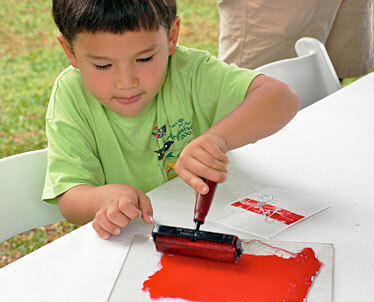 One ArtSpree participant tried his hand at printmaking at a past event. The Contemporary Museum will mark its 20th anniversary this year with special events, including a garden party on Oct. 18, a garden sale from Oct. 18 to 26 and a Benchmark project where 20 artists with Hawaii ties will each design and paint a bench. The benches will be displayed and put up for bid in a silent auction during the week of the garden sale. Museum admission will be free throughout October (those in their 20s will receive free admission Oct. 1 through Sept. 30, 2009), and visitors on TCM's actual birthday, Oct. 22, can enjoy a complimentary piece of cake. October visitors can also enter a drawing to win one of 20 one-year individual memberships. TCM is the only Hawaii museum focusing on contemporary art, defined as significant works dating from 1940 to the present. It offers gallery talks, workshops relating to exhibitions, and programs for individuals and groups throughout the year. Activities include guided 45-minute tours daily, except Mondays, beginning at 1:30 p.m. (free with paid admission; call 237-5217), and art classes and summer workshops for kids 5 through 12 (call 237-5230). TCM is open from 10 a.m. to 4 p.m. Tuesdays to Saturdays and from noon to 4 p.m. Sundays, except major holidays. Admission is $5 for adults and $3 for students and seniors 62 and older. Admission is free for ages 12 and younger, and for everyone on the third Thursday each month.